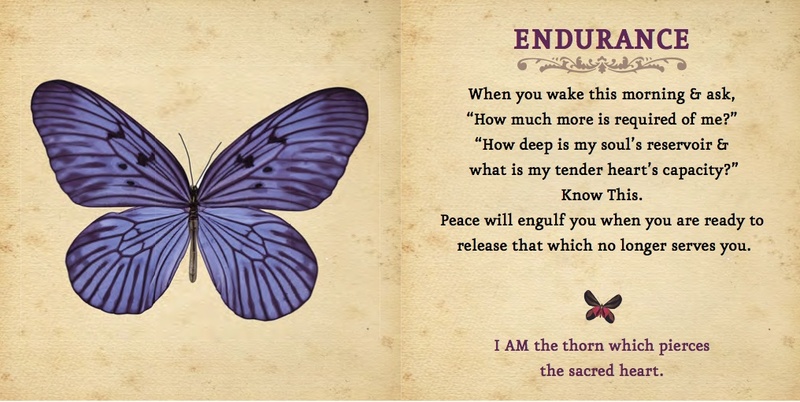 56 contemplative cards & short stories on awakening to assist the birth of your Divine self during these extraordinary times. Higher knowledge & wisdom bring a deeper understanding of the power of your thoughts. Your words and actions are a reflection of your commitment & disciple. No one other than yourself can be responsible for their outcome. It is not power you are afraid of……but it is the responsibility that accompanies it’s use. I AM YOU standing in your higher power. Take a moment to consider the opposite of the first line above. For example, your thoughts would be random impulsive thinking without reflection & divine guidance. Now, apply that impulsive thinking to your words. Would your words then become impulsive, ego centered and unconscious? Take it one step further to your actions. What actions spring from impulsive, ego centered and unconscious human beings? We are all born loving, creative, powerful beings made from the stardust of our Creator. Re-Birth your thoughts from your conscious stillness and heart center. Infuse your words with energy directed from an expanded heart & calm mind. From this your creations will be in service to the higher good of us all. Humanity needs a conscious YOU! This entry was posted in Emerging Soul Cards on June 14, 2016 by Rebecca Winters Rodriguez. Initial words & actions may trigger pain & anger. Holding on to their memory creates endless suffering for all of humanity. & the generational healing that follows when you forgive yourself & others. The true act of forgiveness is one of the most powerful achievements a human being can attain in this world. It is the grand achievement that the great mystic & teacher Jesus was hoping to inspire within each of us. It is an act unlike anything else in the human experience because forgiveness not only serves you and your trespasser, but it also serves humanity. What act of forgiveness is waiting to unfold within your life? What powerful steps are you about to take in your life that will raise all of us higher? I know you can do it because I did. This entry was posted in Emerging Soul Cards on March 16, 2016 by Rebecca Winters Rodriguez. When you are ready, more of what is occurring beneath the surface of your life will be revealed. Unseen energies & alchemical processes are constantly taking place. Your conscious participation is now more vital than ever before. but is interpreted through the awakened heart. Allow the winds of the unknown to part the veil, if only for a moment, so you may see…. IAM the Mystery and You are the Mystic. We all carry stories about our lives, our families, childhood, our friends & our lovers. I have carried a story about my parents for 40 years and another about my first love for 30. There are photos of my stories stashed somewhere deep within me as a some kind of ‘proof’ that they are true and undeniable. Who creates the story around the events in our lives? And who is just watching….silently observing? This entry was posted in Emerging Soul Cards and tagged compassion, hidden meaning in photographs or stories, Mystery, Mystic on February 14, 2016 by Rebecca Winters Rodriguez. As you make more room for Me in your life, everything you do becomes a blessing, even to strangers you will never meet. Your unseen acts of kindness & silent prayers are eternal. And as they ripple across the universe, you will soon realize…. When we are in alignment with our core self we are open to miracles. Alignment occurs when all of our bodies have lined up…. Emotional, Intellectual, Physical, Spiritual….and we become perfect vessels for creator’s light to flow in & through us. That living light may carry wisdom, healing energies, joy, forgiveness, grace, compassion or pure divine love. And it can be the response to our invocation or to another’s prayer. This story of awakening revolves around a hospice worker I know who was at the bedside of a dying man and became the vessel for the final wish of his lifetime. 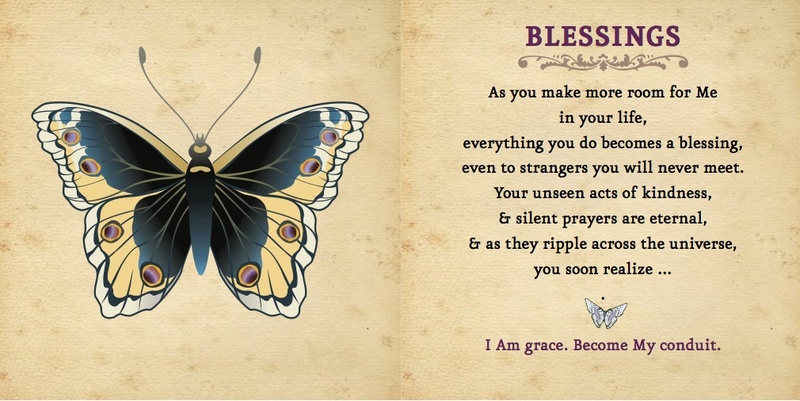 This entry was posted in Emerging Soul Cards on October 11, 2015 by Rebecca Winters Rodriguez. There is something about the predawn hours that gently awakens me each morning. A presence in those silent hours beckons me to my bedroom window as if to witness the beauty of nature rising just before the sun to celebrate another day. So I to celebrate each new day with a ritual of celebration and presence. To help me stay in the moment, my first thought of the morning is, “Creator, What are we going to do today?” This keeps me in wonder and not worry about my emerging day. Then I sift through my seashell filled with tiny icon’s. Each one, from items of nature to Mexican Milagros, has a special meaning. Ladybug & sacred geometry, humming bird & joy, leapfrogs mean standing on someone’s shoulder to see beyond illusion etc. etc.. This morning it is the Bumble Bee, my icon of ‘everything is possible!”. I set this sweet symbol of abundance in view for the rest of my day to remind me that I am guided by a wonderful presence that greets me each morning.